The Fillmore 50’s price tag may cause a sharp intake of breath for some, but we think it’s justified. Has Mesa just made your perfect amp? Superlative, vintage Boogie-inspired low-to-medium gain tone. It’s not quite as loud as we were expecting for a 50-watter. It’s relatively expensive, especially if you need the extra punch of an extension cabinet. heads, which have dominated metal and rock since the early 1990s. However, it’s worth remembering that these giants were actually Mesa’s second game-changers. Two decades earlier, Randall Smith created the original high-gain stack killer, the amp simply known as the Boogie. 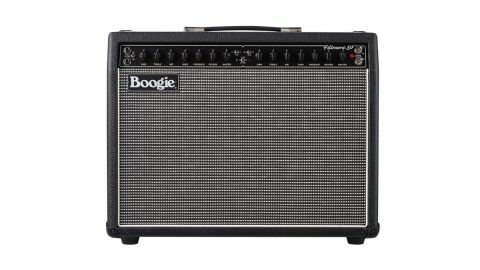 The original Boogie amp was the first to use cascaded gain controls, and arguably the first amp built from the ground up as a true musical instrument in its own right, with a unique tone and ability to sustain almost indefinitely. Compared with later Mark amps and Rectifiers, early Boogies had a sweeter, rounder tone, but were just as gained-out and expressive. On a few previous occasions, Mesa revisited the original format; now there’s a new amp that promises to properly redefine that original Boogie sound as never before. Named for the legendary East and West Coast concert venues, let’s welcome the all-new Mesa Fillmore 50. Like all Mesa products, the Fillmore 50 is beautifully designed and put together with a real eye for detail. The standard trim looks suitably vintage, with perfectly fitted black vinyl and a black control panel with simple chickenhead knobs. In the top left of the black-and-white jute speaker grille is the original Boogie badge, a pointer to the Fillmore 50’s inspiration. Inside the tough aluminium chassis, the electronics are arranged on high-quality printed circuit boards - one for the power valves, one for the rear panel sockets and one large board for everything else, including the five preamp valve sockets. While earlier Mesa amps featured pad and trace circuit layouts hand-drawn by Randall Smith himself, the Fillmore’s boards are CAD-drawn, although there are still a few typically Mesa quirks in the layout that point to old-school Boogie design. It’s good to see that Mesa still hand-wires all the front-panel controls for superior reliability. Meanwhile, the circuit boards still have that distinctive Boogie look, thanks to custom resistors, ‘orange drop’ capacitors and ultra-neat wiring. The Fillmore 50 combo features two independent footswitchable preamp channels, with identical sounds and controls - something Mesa calls Channel Cloning. It means you can replicate one great sound and use it for rhythm and lead, adding a touch of extra gain and volume if needed. Compared with most Boogie amps, the control panel is simple. There’s a single input jack socket followed by an output power switch offering 50-watt or 25-watt options. Next come the channel controls, with two sets of gain, bass, mid, treble, presence, reverb and master volume. There’s also a pair of mini-toggle switches that pre-set the channel to one of three voices: Clean, Drive and Hi. Sat in between the middle of the panel is another mini-toggle for changing channels when the footswitch isn’t in use. The Fillmore’s rear layout continues in the same ‘less is more’ format, offering a simple series effects loop and a trio of loudspeaker jacks - clean, functional and almost spartan by Mesa standards. There are two footswitch jacks: one under the input jack changes channels, with an optional reverb footswitch jack on the rear panel. Overall, the build quality is typical of what we’ve come to expect from Mesa. As well as being pleasing to the eye, the Fillmore is as hard as nails and should handle anything thrown at it. The first thing that impresses us at switch-on is the Fillmore 50’s lack of electrical noise. Hiss and hum levels are exceptionally low, even with the reverb level maxed out, making the Fillmore equally rewarding for quiet home use, studio or stage. This wasn’t always the case on some earlier Boogie iterations. However, all the recent models we’ve tried are exceptionally quiet. We tested the Fillmore with a variety of different guitars covering all the popular tonal bases, including a PAF-loaded Les Paul, an MHS-powered Custom Shop ’63 ES-335 replica and a pair of Strats (one with Duncan Alnico Pro IIs, the other a stock USA ’63 reissue). The Fillmore 50’s lower gain clean voice has the sparkling treble and buttery midrange scoop of classic Blackface tone, flattering to single coils but creating real magic with PAF-style humbuckers. At around one o’clock on the gain control, there’s a subtle drive and smoky midrange lift, with more of a tweed character that’s outstanding for jazz, blues and roots genres and really sings at high volume. The Drive voice adds a forceful edge to this sound, creating a more aggressive tone that sits well for Texas blues lead and rhythm parts. The Fillmore’s Hi lead tone is a magnificent modern take on the smoother lead sounds of the late Mark I and early Mark II Boogie, packed with layer upon layer of smouldering harmonic bite, changing emphasis and colour depending on how hard you hit the strings (and sustaining what seems like forever at higher gain settings). It’s Santana, early Larry Carlton, Knopfler, Keith Richards and much more. Every guitar we plugged in sang through this channel. The Fillmore’s reverb also deserves a special mention. It’s remarkably free of the noise and splatter that often affects many spring reverb effects. A warm natural ambience at lower settings, it turns into a deep cavern at full power, but without overpowering the guitar. The Fillmore 50’s classic Boogie-inspired tones are full of spine-tingling nostalgia yet manage to sound fresh and contemporary, with exceptional range from a simple control panel layout that makes dialling in any guitar intuitive, rewarding and, above all, great fun. Our only small reservation is that for some lower gain stuff, the Fillmore could do with a little more volume, perhaps making an extension cabinet necessary for some players. Stick the gains up around 12 o’clock, though, and it’s definitely loud enough. Still, if we’re being really picky, it would have been nice to see a footswitch for that effects loop. The Fillmore 50’s price tag may cause a sharp intake of breath for some, but we think it’s justified. You’re getting a top-drawer amp that’s aimed at professional and dedicated amateur players, with build quality, tone and creative potential to last a lifetime (at around half the cost of a decent custom shop guitar). Has Mesa just made your perfect amp?